Not sure where November went – it was a bit of a blur. I went to the Lake District for the first time ever to participate in my (kind of) new hobby, walking. I know, Tuppenny, beautiful countryside merely 1.5 hours away in the car, pretty much on my doorstep and yet I’d never been before! No excuse really, just never crossed my mind! Would definitely go back, it was lovely, although I’m not sure I’d want to live there long-term, bit too remote for my liking and I’m not fond of driving down country roads. Perhaps there’s too much of a City gal in me. 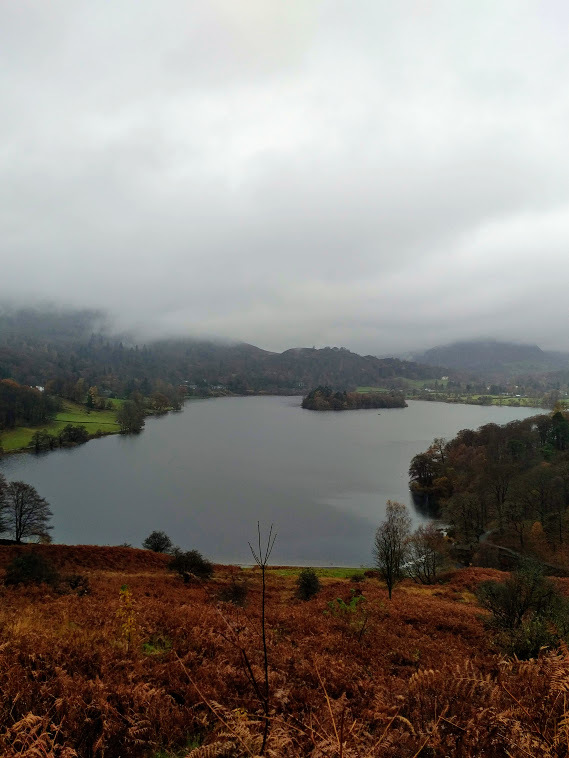 Anyway, stayed in Bowness-on-Windermere and went on the Grasmere to Alcock Tarn walk (around 9 miles). Typically, it was raining and cold but after the extreme weather I experienced in Snowdonia, this was a bit of a doddle and felt quite mild :-). Although there was a part of the walk where we had to cross a fast flowing stream, jumping over slippery rocks and I ended up with what felt like half the stream in my boot! Anyway, how did I get on with my savings? I saved 36.3%, which sees my average savings rate going down a little to 43.7%. Not bad really, although I’ve not done much in terms of any Christmas shopping yet. For the first time, I actually bought something on Black Friday but it was on behalf of family. I did make one significant purchase this month – a new mattress after checking out Kiernan’s mattress review website as I didn’t know what to get. Suffice to say, I’m very happy with my purchase, although there were some shenanigans regarding delivery. 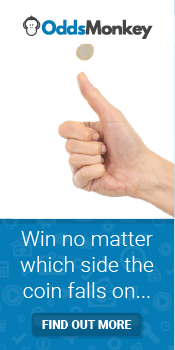 The above savings includes top ups from £240 matched betting profits (from last month), £10 lotto winnings and £124.50 affiliate income from OddsMonkey (thank you to all who signed up via my links!). No new investments, just added to existing ones. AJBell Youinvest had their own Black Friday offer (fee-free trades) so I took the opportunity to finally offload my Vodafone shares. Yield is currently an insane 7.9% but I’m not confident this will continue in the long term. With the loss in capital and dividend income over the years I held the stock, I probably more than broke even (would have been a loss if I’d paid trading fees to sell). Speaking of AJBell, I’ve applied for shares for when they float on the stock exchange later this month. The shares probably won’t be as lucrative as the Hargreaves Lansdown ones (which sadly, I didn’t buy) but as an existing customer of theirs, I thought they’ll be worth a punt. The markets appear to have recovered a little so my Future Fund is heading in the right direction again, sitting at £146,601. I’m resigned to the fact that I’m unlikely to end the year >£150k unless there’s going to be a really really generous Santa Rally! 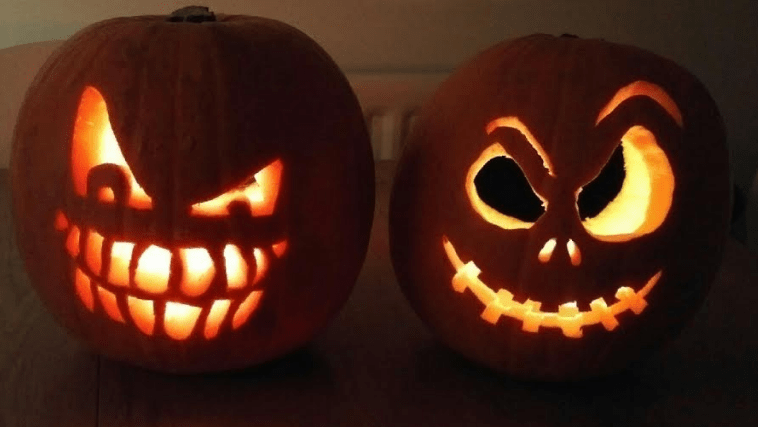 In the spirit of All Hallows’ Eve (although I don’t have time for trick or treaters), I’ve enjoyed carving pumpkins, having pumpkin in my casserole and munching on pumpkin seeds but was it a horror show for me, investment-wise? During the recent stock market upheavals, I made a point of not checking my investment numbers (apart from my Dogs of the FTSE portfolio). I didn’t see the point of scaring/torturing myself. So I was able to ignore all the hysterical news and remain blissfully ignorant…until now! Firstly, how did I get on with my savings? I saved 41.2%, which sees my average savings rate going down a little to 44.4%. 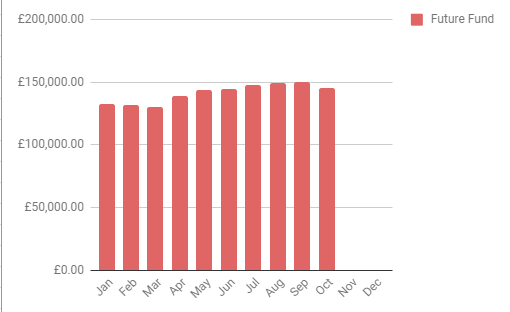 It’s all downhill from now until the new year as the spendy months are here, plus I need to pay off my holiday flight. The above savings includes top ups from £430 matched betting profits (from last month), £78.20 from TopCashback*, £20 lotto winnings and £80.40 affiliate income from OddsMonkey (thank you to all who signed up via my links!). No new investments, I just topped up existing ones. Well, I can confirm that the value of my Future Fund was affected negatively by the volatile markets. No need to panic – it’s just sort of back to where it was in June, so no disaster. I was preparing myself for the worst and as with the recent budget, in the end, not a lot happened. It would be good to get back over the £150k mark by the end of the year, so let’s hope things pick up over the next month or so. My balance now stands at £145,068 and I will continue to invest as normal. When I first heard the song, ‘Just Got Paid’, I felt a sudden wave of emotion – so much so that I had to stop what I was doing. When the song ended, I played it again. The gleeful chorus/riff brings about feelings of sheer absolute joy and describe exactly how I used to feel when I got paid, during the time when I was buried in credit card debt, back in the mid-2000s. Some of the lyrics describe my irresponsibility with money back then and yup, if I could dance like that, I would have been dancing like those girls in the video! I no longer experience this joyful feeling when my wage hits my bank account these days. It’s not that I’m not happy when I get paid because of course I am. But perhaps it’s because back in those debt ridden days, being paid meant huge relief and happiness that I had money in the bank to spend, to pay off my debts, to plug my overdraft (if only temporarily) and that for a short while, I was financially ok…until I became skint and the cycle would being again as I waited for the next pay day. Nowadays, I get paid, I check my bank a few days later to see automatic amounts going out for my investments, my bills being paid automatically, all tickety-boo, all quite clinical really. No sheer joy here but also, no fear or grief or stress that it’s all going to run out soon. And this got me thinking – the next time I’m likely to get these happy feelings of getting paid will be when I stop working and am living off my investments/dividends/pensions etc. Yes, because I will have gotten ‘paid’ for doing nothing! Just a short post, it’s been a long week and the post I was going to put up didn’t get finished so let me just end on that thought, dance to this top tune and hope you all have a great weekend! For someone who’s never really counted ‘walking’ as a favourite past-time, I did quite a lot of it this month. Spent a couple of weekends doing ‘practice’ walks in the Peak District and the West Pennines, which I found surprisingly quite pleasant – not strolls but not too strenuous either. The practice walks were to prepare me for a charity walk in Snowdonia, organised by work. 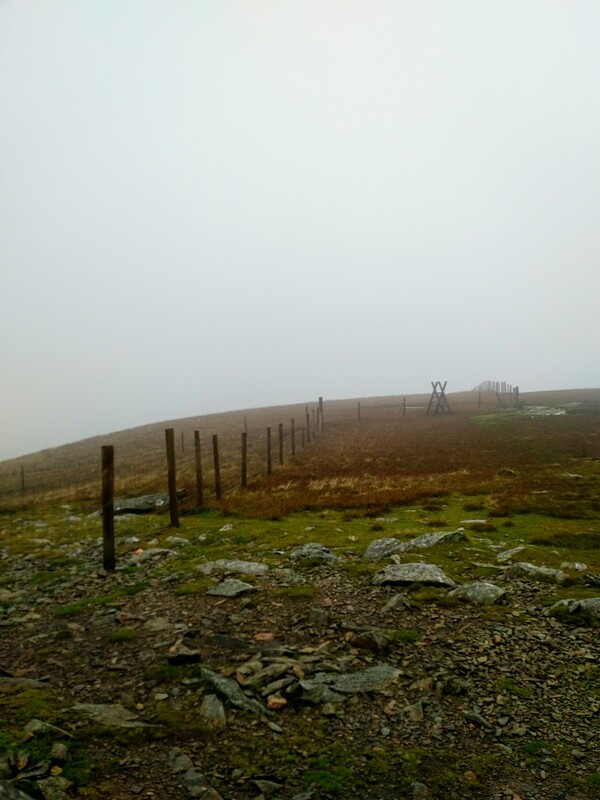 We managed to choose a day which was in between two days with yellow weather warnings and ended up doing the walk in extreme weather conditions and quite poor visibility. With lashing rain which stung the face and winds still buoyed by recent storms in the country which blew us all over the place, I found out that my waterproof jacket was not waterproof and neither were my walking shoes! But I’m glad I attempted and completed the 9-mile walk, it was a good test of character! Plus I might even go on more walks in future (weather permitting), as may have discovered a new hobby of sorts! 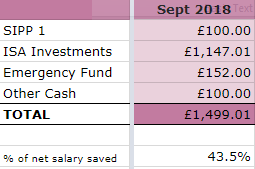 Anyway, onto the nitty gritty, how did I get on with my savings? I saved 43.5%, which sees my average savings rate going down a little to 44.8%. Considering this month was quiet on the social outing front, I’m a little disappointed if I’m honest as I thought I would be closer to 50%. No realistic chance of achieving my goal now with the final (more expensive) stretch of the year coming up but I’ll keep at it. The above savings includes top ups from £447 matched betting profits (from last month), £16.15 from TopCashback*, £60.53 from Google Adsense and £123.33 affiliate income from OddsMonkey (thank you to all who signed up via my links!). 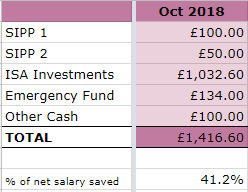 Again, I didn’t really notice what the markets were doing – all I can say is that with extra capital and reinvested dividends, my Future Fund now stands at £150,051, so I’m halfway towards my next big milestone! Woohoo! 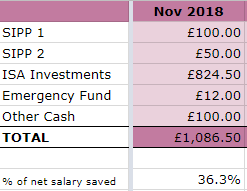 I seem to have streaked well ahead of John K (whose portfolio is currently showing as £103,427) but I did mention that I had the massive advantage of chucking in a large chunk of my redundancy money last year. The next £50k will take much longer to accumulate as no large amounts of capital to throw in, so plenty of opportunity for John to catch up using his strategy.